Jackie is Chartered Accountant and Chartered Business Valuator with over 15 years of experience in strategic investment analysis, business valuations, financial modelling, corporate finance and accounting. Jackie began her career with Pricewaterhouse Coopers, working in the Vancouver and Toronto offices, and specialized in business valuations and mergers and acquisition due diligence. She later joined Teekay Corporation where she held senior roles in the Strategic Development and Finance departments. Jackie worked closely with the TK Gas group, helping negotiate and secure LNG contracts, finance vessels and assisting with the launch of TK LNG Partners LP. 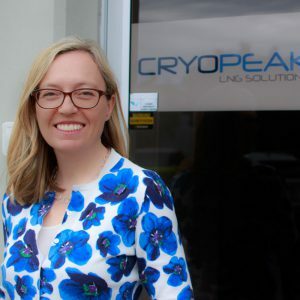 In addition to her role at Cryopeak, Jackie is Vice President at Anglemont Financial Ltd, the Canadian subsidiary of Kattegat Limited. In this role, she advises and helps manage the shipping portfolio of the Kattegat Trust, a private charitable trust established by Torben Karlshoej, the founder of Teekay Corporation.